Istanbul is a city that satisfies all five senses; there is an impressive array of historical architecture to see, sounds of seagulls flocking in air mixed with ferry horns to hear, roasted chestnuts in winter and bougainvilleas in the summer to smell, all different textures you can touch and feel at the Grand Bazaar and last but not least all the food to taste; from kebabs to stuffed mussels to baklava and freshly baked simit... oh the food. Turkey has a rich cuisine, in fact so rich that it might take a lifetime to fully taste all the different flavors and dishes each and every region offers. Besides the abundance of flavors, Turkish cuisine has its share of creative dishes, from vegetables used in jams, to intestines cooked up with spices. 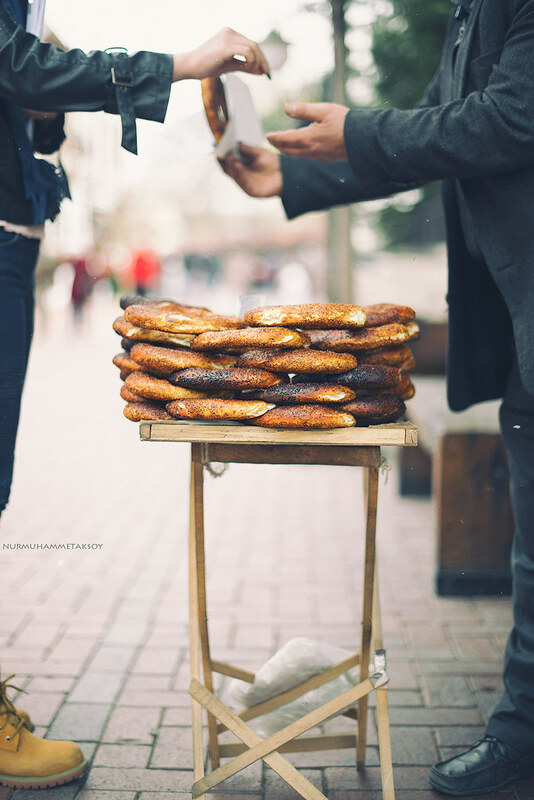 I asked my friend Eda, founder of istanbulite, to help me list the most creative foods, as well as delicious street treats one can find in the city. As a tour guide, she had quite the knowledge. In the Black Sea region, fish is abundant. 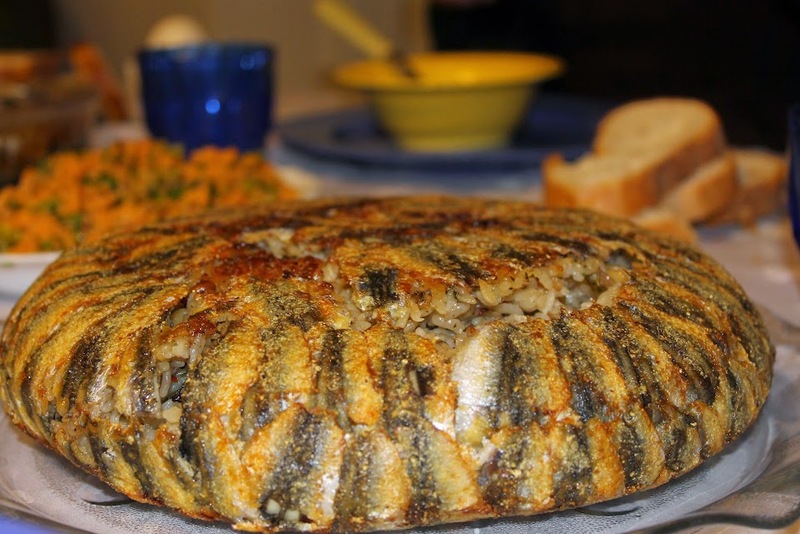 Hamsi - a type of European anchovy- is used in many dishes from fried little snacks that you can finish in two bites to hamsi pilavı, a rice dish with a thick layer of the little guys. Wondering where to taste this concoction without traveling up north? Look no further than Hayvore, a restaurant in Beyoğlu that specializes in Black Sea region’s cuisine. Although an elaborate looking dish, the simple idea is to line up the cooking pan with the hamsi without leaving a sliver of blank space. Then the hamsi lined pan gets filled with a rice mixture which includes pine nuts, currants, dill and spices. Once the rice is evenly spread over the fish, cover it completely with the remaining fish and bake in the oven. It’s a rich and buttery dish that has extremely complex flavors. Speaking of filled or stuffed dishes. Give a Turkish cook a vegetable and watch him/her find a way to stuff it with meat or rice. Imagine chard leaves, vine leaves, cabbage leaves, tomatoes, peppers, zucchinis, eggplants… you name it. All of these vegetables can be prepared cold with a rice filling or hot with a minced meat mixture served with creamy, thick yogurt. If these don’t sound that strange, be prepared for the next thing I’m about to tell you; stuffed melon. 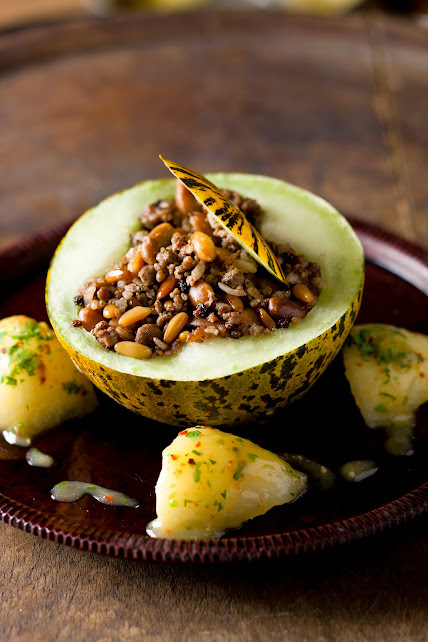 Imagine a juicy and sweet melon, cored and stuffed with minced meat, rice, herbs, almonds and currants. A recipe dating back to 1539, Asitane has been making this dish exactly as the original recipe and serving it up to its customers today. This is the only place in the city to taste such deliciousness. Let’s talk about meat. East is famous for its take on meat and the incredible versions of kebabs. The meat is cubed or ground and spicy or mild. The versions are endless. One that stands out for me is fıstıklı kebap, ground meat with pistachios on a skewer. Unusual pairing, no? Try Zübeyir Ocakbaşı or Ali Ocakbaşı and watch the meat masters cook juicy, fatty kebabs on the coals right in front of you. If a regular cut of meat doesn’t do it for you, then make your way to an işkembeci, the last stop on a night of serious bar hopping. An işkembe -tripe soup, should wake you up right away. If you have the guts (no pun intended) ask for a kelle paça where the offals, head meat and cheeks are also added to the soup. If this doesn’t sober you up I don’t know what will. 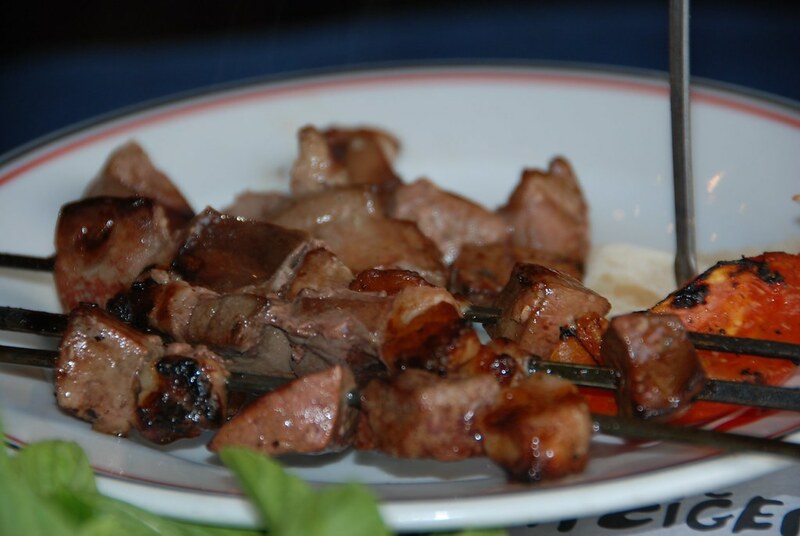 Another unique meat dish would be fried liver, served authentically at Canım Ciğerim (literally translated to "my darling liver"), where cubed pieces of liver come to your table on its skewers alongside raw onion salad, arugula, parsley, lemon and charred tomatoes. Fill up your lavash bread with the ingredients and you have yourself a damn tasty liver burrito. Say you are in the Beyoğlu district for a night out and in the mood for a snack but want it to be cheap and quick. Midye dolması -stuffed mussels, is calling your name. Once the mussels get cooked, the shells get filled with a mixture of herbed rice, pine nuts and currants. 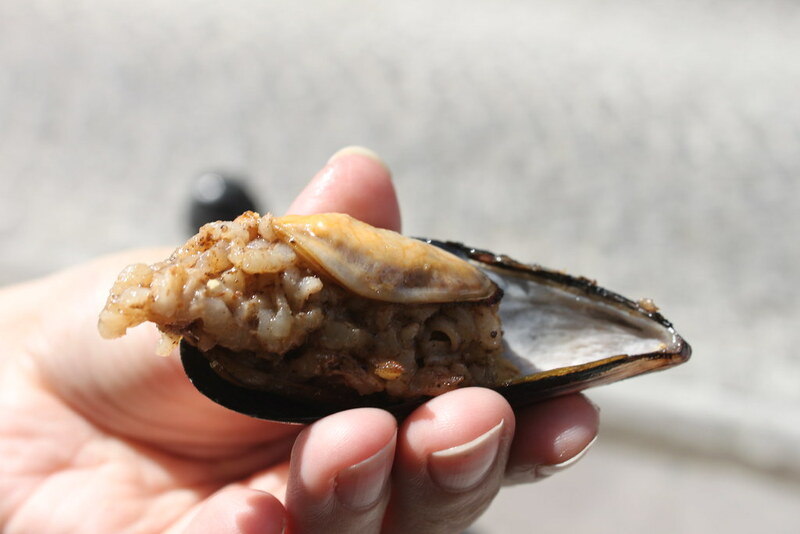 On various street corners you will see people gathered around a vendor, squeezing lemon juice and swallowing down mussel after mussel, right there on the spot. You slurp the whole thing down straight from the shell into your belly and before even swallowing it, you pick up the next piece. It is known that people can eat up to 60-70 at once, go with your own pace and don’t start a drunk competition with the guy next to you. In Turkish cuisine vegetables seem to transform themselves into sweet flavors. A typical breakfast isn’t complete without jams so don’t be surprised if you see tomato, eggplant or walnut jam on your breakfast table. You won’t find these on every breakfast place, but look for authentic restaurants that make their homemade jam, you’ll be sure to taste something interesting. Yogurt is like the Mother Queen in Turkish cuisine, it finds its way next to many dishes, sometimes in all its creamy and shiny glory, other times rather peculiarly. If you’re familiar with ayran, the salty yogurt drink, then you wouldn’t be a stranger to yayla çorbası. A yogurt soup made with rice, herbs (think mint) and sometimes chickpeas. Au contraire to what you might expect, it is actually a hot soup. Yes, hot yogurt soup. 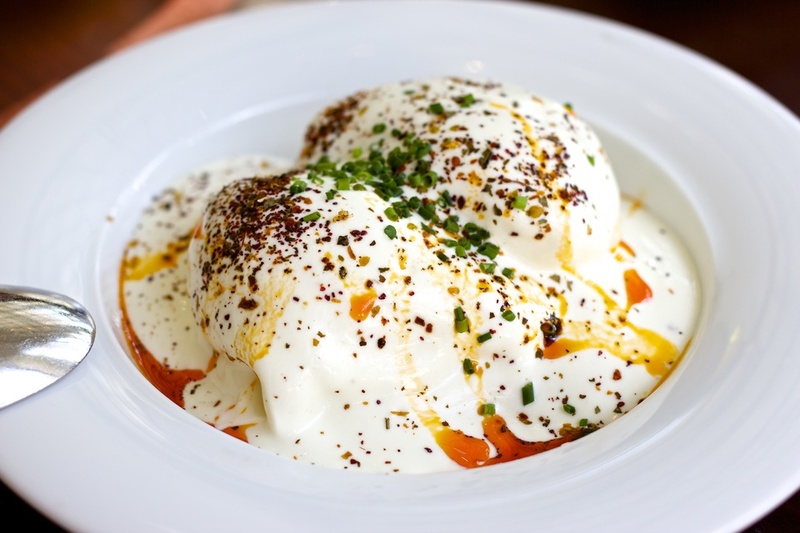 Another dish where the yogurt shines is çılbır, a dish of poached eggs with yogurt. It is known that Ottoman sultans ate çılbır, so we know it must be good. And how could it not be? Tear a piece of freshly toasted bread, dip it into the egg to break the yolk and let it ooze out into the garlicky yogurt. You’ll be licking your plate, then your fingers. For a special kick, top it with melted butter infused with isot, smoky Turkish paprika. Turkish cuisine isn’t all about food, it’s also about drinks. How about pickle juice? 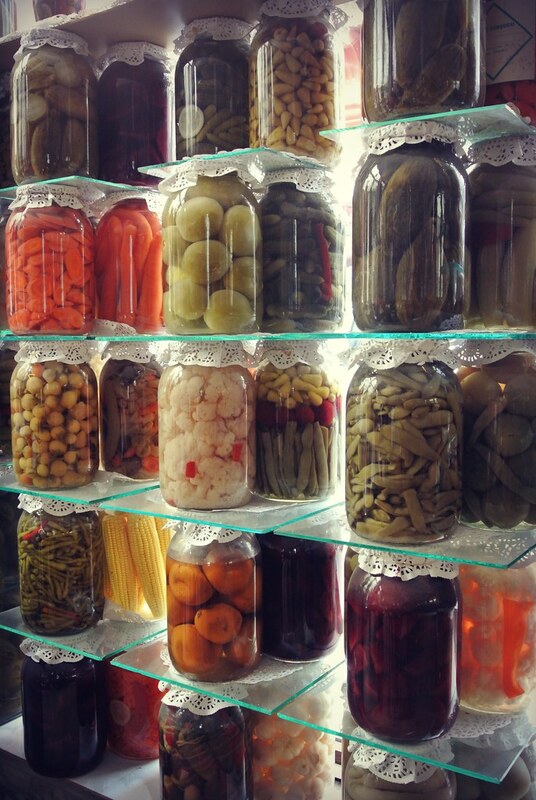 Asri Turşucu in Cihangir has been pickling everything from carrots, peppers, tomatoes to beans and okras, as well as serving up fresh pickle juice since 1938. You don’t have to be pregnant to crave pickle juice and Asri Turşucu is proof to this. Other interesting traditional drinks are şalgam - juice of red carrot pickles, often served with rakı, boza -a fermented wheat drink sprinkled with cinnamon and roasted chickpeas, and salep -a winter favorite of orchid root drink made with hot milk and a generous sprinkle of cinnamon. Last but not least, let’s talk about sweets. 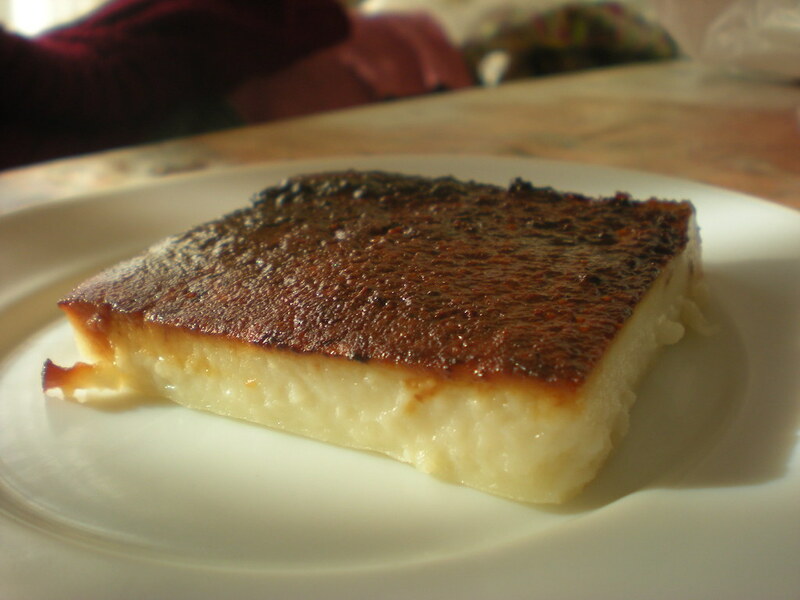 Two unusual desserts you’ll come across are kabak tatlısı and kestane şekeri. Made from baked pumpkins, kabak tatlısı is served with walnuts and a generous amount of kaymak (clotted cream). This dessert is surprisingly not too sweet but definitely requires a special palette. You can find it in almost any muhallebici where traditional Turkish desserts are served. On the other hand, kestane şekeri is so sweet that you might cringe from a sugar overload after one bite. 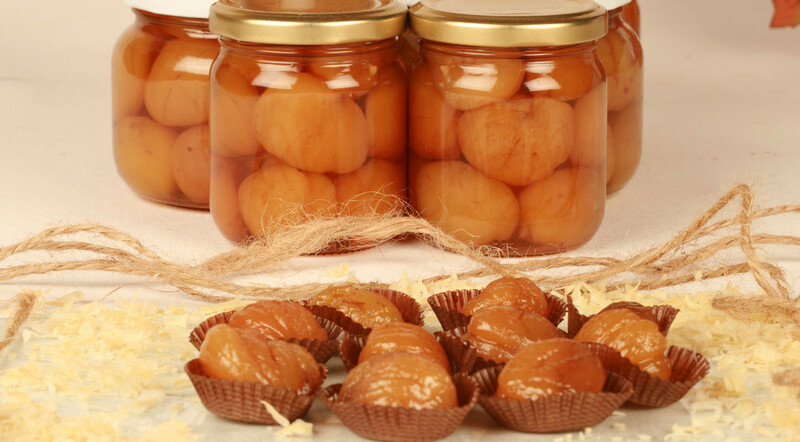 The candied chestnuts are often sold in a jar filled with sweet syrup and often used as an ingredient in dishes. However, I’ve caught myself too many times dipping my spoon into the jar and biting into the thick and plump chestnut with the glaze dripping down my chin. For me the trick has always been to eat a small bite of bread right after to cut off the sweetness. To each their own, right? Now, let’s hear the drumrolls for the most unusual dessert. How about chicken for dessert? If I were to highlight one dish from Turkish cuisine, it would have to be a dessert, actually two desserts that are made of the same ingredients but cooked differently. I present you kazandibi and tavuk göğsü. A pudding made with chicken breast and milk, these dishes taste nothing like chicken and they are simply scrumptious. The chicken is often boiled and shredded into such tiny pieces that you cannot tell what it is neither by its look nor by its taste. Tavuk göğsü literally means chicken breast and is the creamier one of the two desserts, kazandibi has a crusty, almost burned top that adds a nice touch of smokiness to the sweet milky texture. The best examples of these can be tasted at Özkonak in Cihangir, serving simple and traditional dishes as well as delicious desserts for over 50 years. Of course this list doesn’t even come close to representing the greatness of Turkish cuisine, but it should give you a glimpse of how creative and rich it is. Either go out to the streets and explore for yourself, or better yet look into istanbulite’s customized tours. Not a big fan of meat? No problem, let them whip up just the right menu for you and munch your way through Istanbul. Want to Read Yummy Stories? Subscribe to Atdaa Newsletter!